I have travelled this train on many occasions between 1976 and 1991. During that time the service survived the Rhodesian Civil War that led to the formation of Zimbabwe Rhodesia and the country's subsequent independence in 1981 as Zimbabwe. Despite my familiarity with the journey I never ceased to enjoy the atmosphere and excitement of travelling across Africa at night especially when riding the footplate of the steam locomotive at the head of the train. Departure was 8 pm from Bulawayo where the station, which had a 1950s look, always had the feeling that there were rather more platforms than trains. 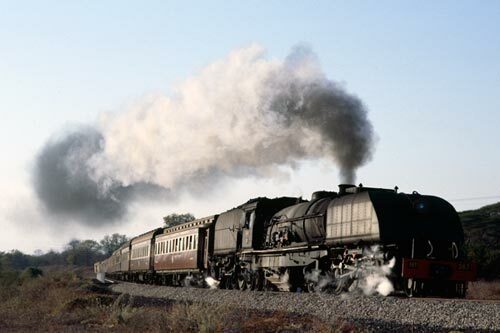 I always arrived early to watch the trains and usually a steam loco was energetically shunting some coaches as it prepared the overnight trains to Victoria Falls and Harare (formerly Salisbury). All the passenger rolling stock was in a chocolate and cream livery which for the most part was well maintained. The earliest carriages dated from the 1940s and sported clerestory roofs. Built in Britain, these solid vehicles had wooden panelled interiors and seemed to be from a bygone age. Newer rolling stock came from South Africa with arc roofs and Formica interiors. Photo - A 15th class Garratt shortly after leaving Thomson Junction with a train for Victoria Falls. Running a few hours late meant you had the chance to see some game. Arriving on the platform passengers could not fail to be impressed as the fourteen coaches stood waiting for departure. Marshalled behind the loco were 3rd and 4th class coaches followed by kitchen and restaurant cars with 1st and 2nd class bringing up the rear. At the head a 15th class 4-8-4+4-8-4 Beyer Garratt with a crew of three that would work this train as far as Thomson Junction. Here another member of the same class would be attached for the final run through to Victoria Falls. Departure was generally prompt and the Garratt eased the train out of the station, past the extensive yards and loco shed, through the northern suburbs to bear left off the Harare main line towards Dete and Victoria Falls. Once over the junction, the Garratt soon gained speed maintaining a steady 50 miles per hour with around 500 tonnes load. With the city lights behind, the view ahead was total darkness with just the headlight illuminating the line. Under your feet you could feel the power as the pistons worked hard maintaining speed. The driver was alert as the fireman kept a steady flow of coal onto the grate maintaining a good head of steam. The third man was the coal pusher who disappeared into the bunker to push coal forward so the fireman had an easier task. You have never experienced the night until you have been able to avoid the light pollution of the developed world. In this part of Africa you can see the stars and spectacular Milky Way. This is darkness. It was uncanny as the driver applied the brakes for the first station stop of the journey. There were no lights beside the line although it soon became apparent that there were a few passengers waiting in the darkness. As the train squealed to a halt all was revealed as the external lights on the train provided the station lighting! Within a few minutes we were off again into the night, a string of bright lights in the night. In the semi-darkness on the footplate, the crew worked as a team hauling the train north. Station followed station with water stops in the middle of nowhere. Occasional waits in loops as we waited for freight trains heading south. In those days steam reigned supreme. Reaching the bright lights of Dete, more water was taken on board ready for the section through the Hwange Game Park to Thomson Junction. Stories of encounters with wild animals especially during the dry season at watering points were common place. Time keeping gradually deteriorated over the years but usually the Bulawayo bound train was passed between in a dark loop somewhere between Dete and Thomson Junction. Thomson Junction was an important station on the line with the adjacent Wankie Colliery providing considerable traffic for the line. It was here that the engine was detached and another with a fresh crew added for the final few hours through to Victoria Falls. If the train was on time the sun came up about 40 minutes before the final destination and you missed breakfast in the dining car. More often than not the train was an hour or two behind schedule so If the sun was already up at Thomson Junction then you would have a relaxing breakfast as the train threaded its way through the bush. The added bonus was the high chance of seeing some game scampering away from the train. About 30 minutes before Victoria Falls you could see the cloud of spray from the massive waterfall. All too soon the train eased its way into the station. When in flower the Jacaranda Trees provided a wonderful backdrop to the train. I always stayed at the Victoria falls Hotel which was adjacent to the station. Usually each train was met by Odwell Makamure one of the most colourful hotel doormen in the world who always remembered you. He provided a fitting end to a superb journey.